A couple of weeks ago, my mother and sister spent a thrilling two and a half hours, mouths ajar, as we were swept up in the theatrics that is Cavalia. We were fortunate that they extended their tour in Brisbane by another week and we managed to wrangle some tickets to a nearly sold-out show. I didn’t really know what to expect, people described it to me as Cirque du Soleil that incorporated horses. I had also seen the larger than life billboards strategically positioned on the highway which added to the mystique and fascination. We arrived on a miserably wet Friday night only to be cocooned quite comfortably in the purpose built Big Top amongst two thousand spectators, all eagerly waiting for the show to begin. There was an assortment of people from wrangler wearing, high-top boot kinda crowd to twenty-somethings in cocktail dresses and young families with weary kids. 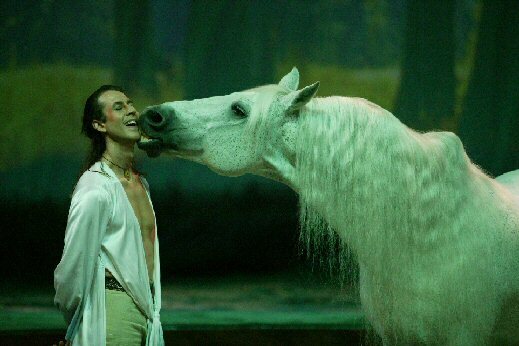 The show began with a series of questions about Cavalia and their star equine performers. With each question multi-choice it was a lovely way to start the show with crowd interaction from the get go. In the pop quiz we found out there are a stable of fifty horses involved in the show with a mixture of stallions and geldings (no mares – for obvious reasons) and these equines are primped and pampered by a team of 20 stable staff including two vets and a farrier. The breeds vary with the majority of the herd Lusitanos, and the remainder are Andalusian (PRE), Canadian Horses, American Quarter Horses, Paint horses, Belgians, Percherons, Arabians, and Appaloosa. 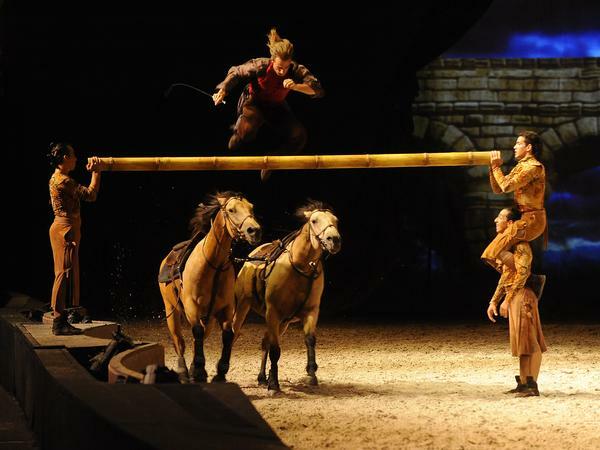 From the get go this production swept me up with its live music and light technology while demonstrating an intrinsic understanding and respect for the spirit of horses. 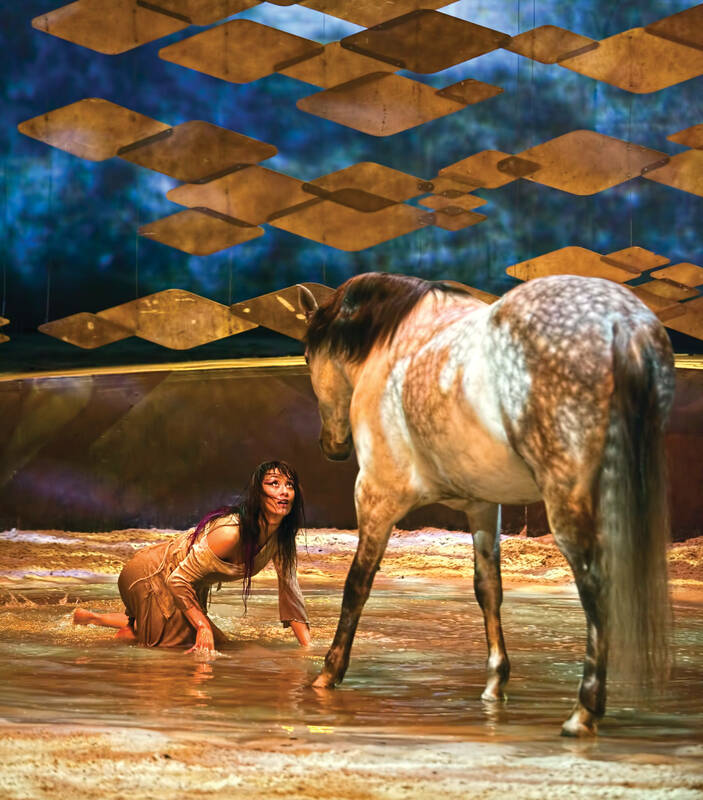 The opening scene with a horse and female dancer was enchanting to say the least as they danced around a lagoon of water. Another favourite scene is the liberty training where the horses are free of bridles and saddles, there is nothing quite like seeing horses in their natural silhouette. Any horse person worth their salt can’t help but admire the talented riders with their advanced dressage skills performed in unison with their riding counterparts. I loved the light and shade throughout the performance where you have the structured, fussiness of the dressage to the rough and rollicking trick riding and horse vaulting. I found myself getting itchy feet at the chance of galloping a team of horses astride two horse while jumping obstacles. The momentum and rhythm of the show built to a heart-stopping crescendo that uplifted the entire audience. All two thousand spectators were up out of their seats with a standing ovation. Cavalia is a tribute to the history and spirt of horses and is a word-class performance of acrobatics, musicians and horsemanship. Bravo!